When I joined the office of the New York County District Attorney in 1972, after a suburban upbringing that was more Ozzie and Harriet than Naked City, I was immediately immersed in the professional side of solving crimes. For thirty years, I had the enormous privilege of working shoulder to shoulder with the best and brightest cops of the NYPD, and with prosecutorial colleagues who had a thirst to do justice and restore dignity to human lives. Best of all was that we got to do our job against the backdrop of the most interesting city in the world. I started my Alex Cooper series of crime novels in 1996, while still in charge of the country’s pioneering Special Victims’ Unit. It was never my intention to make New York a character in my books, but it was inevitable that would happen. We looked at the city differently than my non-law enforcement friends. Every refined institution and elegant façade of Manhattan’s landmark locations masked a dark underside that had been the scene of a violent crime or high-stakes theft. I was at the Metropolitan Opera House in Lincoln Center—the cultural hub of the city—on a beautiful summer evening in 1980 to watch a performance of the Berlin Ballet. The following night, a young violinist from the Met orchestra went backstage to meet the guest conductor after the first act and never returned to her seat for the rest of the performance. It was days later when her body was recovered from an air shaft in the opera house, after her assault and murder by a stagehand who was ultimately convicted of the crimes. It was a feature in the New York Times that alerted me to the fact that there were fifty million bones collecting dust on shelves in the basement of the American Museum of Natural History. Not the remains of dinosaurs that every child goes to that iconic institution to visit, whether a local or tourist. But human bones. Bones that were collected by anthropologists a century ago when studying third world cultures—literally grave-robbing Native American or African village sites. And most shocking of all was the fact that explorers brought six Inuits from Greenland to live in the museum’s basement so that they could be exhibited to gawkers like animals in a zoo. Five of them didn’t survive the first year, and the sixth—a child when he was brought to America—grew up to see his father’s body mounted in a glass case as a museum display. A very dark underside indeed. I knew where Alex Cooper’s cases would take her, because I had walked many of those crime scenes myself. My colleagues and I had handled murders in what seemed to be the most benign settings in the city—from the grassy fields behind the Metropolitan Museum of Art in Central Park to Lincoln Center to the tunnels that stretch for miles beneath Grand Central Terminal. In Devil’s Bridge, Coop and NYPD detectives Chapman and Wallace are drawn into a dangerous situation along the Hudson River—taking in everything from the famed Statue of Liberty in the harbor to the little red lighthouse that stands in the shadow of the George Washington Bridge to the waterway itself—once a burial ground for victims of an infamous Hell’s Kitchen gang known as The Westies. Each book gives me the opportunity to scratch the surface of an area I think I know so well and learn about the history that makes this city so unique. My latest novel—the 18th in the series—is Killer Look. It takes the crew into the Garment District, a one-mile square area that established the city as the fashion capital of the US, rival to Paris, London and Milan, after the invention of the sewing machine made possible mass production of clothing by the 1850s. My guess was that Civil War uniforms were the first items made in the district, but I was wrong. It was actually the making of uniforms for slaves on Southern plantations that started the profitable clothing business on its way. Beneath the fantasy and illusions of the fashion industry, the cutthroat dealings sometimes required to get couture pieces from the drawing board to the customer’s closet gave me plenty of material with which to work. My favorite Manhattan landmark is the great New York Public Library, standing in the heart of the city on Fifth Avenue, guarded by its handsome marble lions, Patience and Fortitude. Danger lurking in the library? You bet. I was a devoted reader of Nancy Drew mysteries as an adolescent, and long wanted to pay homage to the young sleuth who started me on two careers—one in the law, and the other in story-telling. This fall, I’m launching the first book in a new middle-grade series about a twelve year old sleuth named Devlin Quick—called Into the Lion’s Den. What better place to set a mystery than a library—two libraries actually. Not only the majestic NYPL, but the Brooklyn Central Library, which is actually designed in the shape of a book. Devlin encounters a map thief, based on a real-life crime that was solved when the thief—responsible for the theft of millions of dollars worth of rare maps and atlases—dropped his “tools” on the floor of the quiet library. I’m often asked whether I’m afraid I’ll run out of places in the city which to set my novels. No chance of that, I’m sure. There were eight million stories in the naked city decades ago, and they just keep on coming. Linda Fairstein, author of the Alex Cooper series of crime novels, served for thirty years as a prosecutor in the Manhattan District Attorney’s Office. Her 18th Cooper book, Killer Look, will be published by Dutton on July 26. On November 15, Fairstein debuts her middle-grade sleuth, Devlin Quick, in Into the Lion’s Den. While the heroes of the books in both series I’ve written live and work in Manhattan—McNulty the bartender works in a somewhat seedy upper west side bar in the first book, becomes a bar manager temporarily at an upscale fictitious Water Club in the second book, and tends bar again at the fictitious Old Hotel in the third; Raymond Ambler, the amateur detective in my new series, curates the crime fiction collection at the 42nd Street Library—my characters tend to visit the outer boroughs for some of the action. In the first book, McNulty visits his father in Flatbush (Brooklyn) and picks up his son from his ex-wife’s row house in Bay Ridge or Sheepshead Bay. If I remember correctly, he also takes his son to the thoroughbred races at Belmont (Elmont, Queens). The second book takes McNulty to the shell of a building with a sheetmetal door in the South Bronx, has him climbing a fire escape to enter an apartment through a window in Park Slope (Brooklyn), and getting himself shot in Bay Ridge. The third book has forays into Riverdale in the north Bronx and Bainbridge, more-or-less on the other side of the north Bronx. It also includes nefarious doings in the wetlands near Sheepshead Bay in farthest reaches of southern Brooklyn. The newest book, Murder at the 42nd Street Library, begins, after a short prologue, in a cemetery in Brooklyn. I didn’t plan these excursions into the world of New York beyond midtown Manhattan. Those sections of New York are in my consciousness, or perhaps in my unconscious, for a couple of reasons, one of them going back to when I was a kid from Connecticut—the child of an Irish-born gardener and an Irish-born domestic—who visited a passel of aunts in uncles in what were then Irish sections of Flatbush and Park Slope. The more immediate reason though is that from the mid-1970s to the late 1980s I worked for a union that represented the house staff (medical interns and residents) who worked in the city hospitals. The job—representing individual doctors in grievance hearings, helping cadres of young doctors form unions, aiding them in collective bargaining with their employers, and on a couple of occasions helping them maintain picket lines and hold their strikes together in battles with recalcitrant voluntary hospitals—took me all over the city, primarily to the poorer, higher crime areas: Harlem Hospital in upper Manhattan, Bronx-Lebanon and Lincoln in the South Bronx, Coney Island, Brookdale, Kings County (my favorite), and Brooklyn Jewish in pre-gentrified Brooklyn. All of these hospitals were expert in handling the trauma of stabbings and gunshots, as well as the primary killers of poor people, diseases related to cigarettes and alcohol. Because of the job, I got to know the city in the way cops, fire fighters—and these young doctors, many of them FMGs (Foreign Medical Graduates)—got to know it, and got to know the people who lived and worked and tried to make ends meet in these neighborhoods. One of the phenomenons of these neighborhoods were what were then called gypsy cabs. Gypsy cabs were the product of human ingenuity—discovering an unmet need in a community and finding a way to fill it. Because of the high incidence of street crime in these areas regular taxis often didn’t pick up folks they thought were headed there and rarely trolled the streets of the South Bronx or Harlem or Bedford Stuyvesant looking for fares. To satisfy the need for transportation, gypsy cabs emerged (Uber and Lyft before cell phones). For a long time, these cabs were unregulated and unregistered—and unlike Uber—illegal because of this. They served a need in the city, so they continued to exist, despite harassment by the police. I want to tell you a story about one of them that illustrates where my view of New York comes from. One winter evening not long before dark, sometime in the ’80s, the old green Volvo I was driving gave up the ghost on the Cross Bronx Expressway. The expressway, the brainchild of Robert Moses, more or less cuts through the heart of the South Bronx. It’s one of the most congested sections of highway in the nation, and it has always seemed to me the narrowest because in some places there are tall walls on either side of the highway. On this evening, I coasted to the side of the roadway, inches from the cars and semis hurtling past, and sat there for a moment in a state of panic. One of the worst fears of drivers in New York in those pre-cellphone days was to break down in the South Bronx. I don’t remember if there were emergency phones on the Cross Bronx at the time. I don’t think so. Even if there were, this was the South Bronx. Someone would have stolen them or taken the receiver wires to sell the copper. Pay phones were the same story. Even if I walked to the exit I could make out in the distance and climbed out of the highway and could find a pay phone, the overwhelming odds were that the receiver would be missing or the coin box pried open. And wandering around looking lost, which I couldn’t help doing, was a clear invitation to a mugging in those days. I stood in front of the stalled car, watched for a Yellow Cab with the dome light lit, and half-heartedly attempted to flag one down. That the cabs and everyone one else came by in herds at about sixty miles an hour suggested this was a futile effort. What happened was a gypsy cab pulled up behind me. Great! I said to myself. This guy has a perfect opportunity to gouge me for all the money I have on me, and any that I can raise, to get me out of this mess. Whatever the price, I was willing to pay. We talked for a moment; he spoke English—what we used to call Nuyorican. He didn’t bring up cost so neither did I. After a bit, he pushed my car with his along the narrow shoulder of the roadway to the exit and through the exit up onto the street. We then opened the hood and stood looking at the motor of the Volvo for a couple of minutes. He said he had a friend who was a mechanic and could call him. I nodded, adding up the cost of this also. They had me at their mercy. A few minutes later, the driver’s friend, the mechanic, showed up , took a bag of tools from the trunk of his car, and began tinkering with the Volvo’s motor. This was New York, the home of a million scams, and the South Bronx to boot—the same city where not long before someone had stolen the battery, the voltage regulator, and both back windows from the rental Toyota I’d parked overnight on Riverside Drive. What was he going to do? Fix something and charge me a couple of hundred dollars? Steal my Bosch carburetor? I had the gypsy cab take me to find a cash machine, which wasn’t easy to find in the South Bronx in those days. When we found one, I took out $140, all that was in there. On the drive back to my car, I told the driver—the guy who pushed me off the Cross Bronx Expressway and then drove around for a half-hour to find a cash machine—that I didn’t have a lot of money, and wasn’t sure I could afford all this, and how much was he going to charge me altogether. When we got back, the mechanic, by some miracle of streetwise auto repair, had the Volvo running. He charged me two bucks for a part he’d happened to have with him. I tried to give the driver twenty bucks but he wouldn’t take it. Now, if your car broke down outside a small town in Iowa and someone came along and gave you a push and helped you get started, you wouldn’t be surprised. You might even expect this kind of neighborly act. But New York City? The South Bronx? That’s different, right? Well, maybe not so different. It’s a kind of neighborly place after all. Con Lehane is the author of Murder at the 42nd Street Library, the first in a new series featuring librarian/archivist Raymond Ambler. He’s also the author of the Bartender Brian McNulty mystery series. Many people who come to New York find themselves disappointed. For most the letdown doesn’t last long. Soaring towers, racing crowds, artistic yeastiness; the rivers, shorelines, cabs, clubs; huge Broadway theaters and tiny fifty-seat houses; concert halls and museums and galleries; high-rises, low-rises, town houses and pretty little suburban streets in the boroughs; and a seemingly bottomless well of various types of foods for all hours, tastes, and budgets—it’s all real, it’s all here, and it is, satisfyingly, too much to explore in a single lifetime. I have a sneaking suspicion a person needs to walk down every street in every neighborhood at least every six months just to keep up, so next time you’re back on that block the changes don’t make your head spin. If there’s initial disappointment, however, it comes from disorientation born from expectation. New York moves so fast, changes so fast, grows and morphs so fast, that whatever New York you’ve come to connect with, whatever New York you thought you were looking for, it’s already gone. The noir city of the thirties and forties, the leftist-politico one of the sixties, the dissolute club-glam eighties New York and the money-to-burn metropolis of the Gordon Gekko nineties, they’re all ancient history. Oh, steam still rises from the manholes on rainy nights, and socialists still hold earnest potlucks, and Wall Street analysts, whatever it is they do, still take home vast bonuses, but the city’s moved on. The mood’s different, the people who embody it are different. So new arrivals need some time to re-position, and when they start to leave behind what they thought they’d find and look at what’s really here, they’re excited to dig in and be part of it. And what is it they’re part of? This is my New York, and the city I want to carry people off to in my books. I’m not interested in what happens on 57th Street and 5th Avenue. I don’t care about Breakfast at Tiffany’s, but I’ll sit down with you over Lebanese flatbread and white cheese in Brooklyn, or a Japanese noodle soup set in the East Village, or shrimp and grits in Harlem. I can take you to a Mongolian Tsagaan Saar, with dumplings and throat singing; a Peruvian Day Festival, with wild dancers; and a Lunar New Year Parade in Flushing, Queens, where the Italian private trash collection company rented monkey costumes for its workers (it’s the Year of the Monkey) and had them waving to the kids from their perches on the outside of its garbage trucks. What celebrities frequent which hotel lounges doesn’t interest me, but a young poet reading from his first chapbook at the New York Singapore Literature Festival has my complete attention. It’s the interweaving, the connecting, the places where the borders melt into each other and people, once they step over them, aren’t the same—that’s what fascinates me. 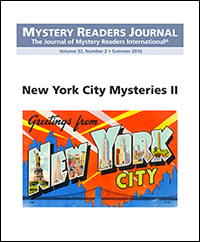 That’s the New York I love to live in, and the New York I hope Lydia Chin and Bill Smith can help show my readers. So even people who’ve never been here will love New York, too. S.J. Rozan is multiple-award-winning author and a life-long New Yorker. She’s written fifteen novels and more than fifty short stories. Eleven of the novels and many of the stories are in the Lydia Chin/Bill Smith series based in Chinatown, and most of her non-series work is set in New York, also, because she just can’t get enough.